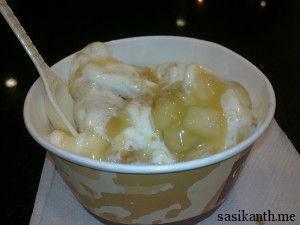 People have been raving about how good the shakes are at this new place in Manjeera mall. So finally, after a movie at Cinepolis last week, I got to try it myself. 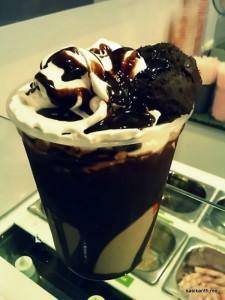 I asked the guy at the counter about their best offering, and he suggested Choco Brownie Crumble. I ordered for it with whipped cream (additional). It took about 10 minutes for the shake to be made. It looked good but I was disappointed with the quantity served. On taste front, it was really thick (as it should have been), and was yum. 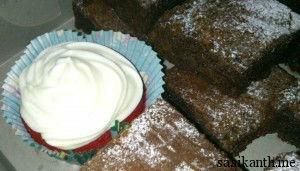 The whipped cream was delicious, but the brownie could have been better. A yummilicious shake, but I wasn’t really happy overall. I paid close to 200 bucks for the shake, and it really didn’t seem like value for money. Maybe it’s something you can afford once in a while, but definitely not worth on a daily basis. Having read about this place on Zomato (listed on best bakeries), I decided to give it a try before venturing onto a movie at INOX. It’s a small yet brightly lit stall in the food court, displaying all the pastries and savouries. 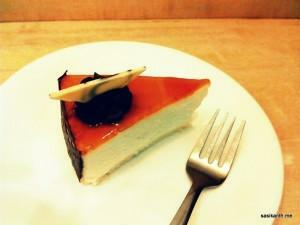 Their signature Blueberry cheesecake was done for the day, and I opted for a Tiramisu. The Tiramisu was pretty decent. Though it was creamy, I thought it could have done away with a little sugar. I was actually struggling to finish it off towards the end for it was that heavy. I like my desserts creamy and light, and this met only one criteria. The price seemed a little too steep for a small slice which didn’t really seem worth the money. I’d give it another try for their Blueberry Cheesecake before I certify this place. I’ve always loved cakes and pastries more than ice-creams when it came to desserts, and Theobroma serves the best pastries in Mumbai, so I had to be here. After the heavy meal at Cafe Churchill, which included a Blueberry Cheesecake, and a long walk along Gateway, me and a friend dropped in to their store at Colaba. At around 4:00 PM, the place was pretty much packed (as usual). We walked to the counter, and while we’re deciding on what to indulge on, the elderly lady at the counter suggested we try the Vodka Chilli Cheesecake. That apart, we asked for a Devil’s Mousse Cake. We took a seat in a corner, and the cakes were served immediately. The Cheesecake tasted very different from what I’ve ever tasted before (probably because of the liquor) and had a strong aftertaste thanks to the chilli. Thought not my favorite, it was good nevertheless. On the other hand, I absolutely loved the Devil’s Mousse. This flourless cake was creamy, very light, and melt in my mouth. 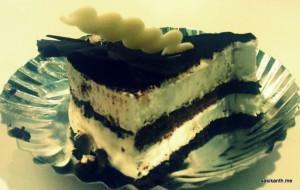 I wouldn’t mind travelling to Mumbai again just for a taste of this cake. Yummilicious. The very next day, met a few college friends and we dropped in to the store at Lokhandwala. Surprisingly, this place was empty, and had fewer options compared to the store at Colaba. 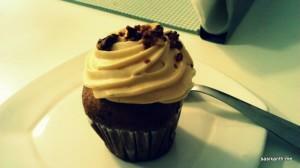 While others tried a sugarless Brownie and Red Velvet Cheesecake, I opted for Banana Caramel Cupcake. I had tried their Blueberry mini cupcake the last time around at Colaba, and it turned out to be the best cupcake I’ve ever tasted, so had high expectations from this one. While it wasn’t as great as the one I remember, it was still pretty good. I don’t think it was fresh, and that is the reason it didn’t taste great. 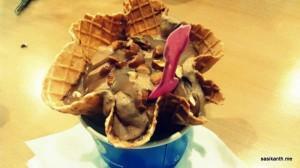 If you love your desserts, this place is a must try in Mumbai. They have stores all over the city, but I’d suggest you try the one at Colaba. Everything is reasonably priced, the ambiance is pretty neat, and most of the cakes and pastries are excellent. I wish they opened a branch in Hyderabad. Go try their cakes now! Met a couple of friends the other night, and after hogging on the last order at Maharaja Chat, decided to stop by at Hazzel for ice cream. I was the one who dragged them here, thanks to the reviews. Walking in at around 11:30 PM, we were surprised to find the place packed. The ambiance is pretty neat, with the place is brightly lit. We sat in a corner, and waited for someone to hand us a menu. After about 10 minutes, we were handed a pretty badly torn menu (one menu for 3 people). The first few pages were filled with food items (I thought this was an ice cream corner :|). We finally found the page with the ice cream offerings, and there were quite a few. After a long discussion, we finally decided on a Sticky Chewy Chocolate, Chocolate Almond Fudge and Chocolate and Cream. It took forever, and I mean forever for the ice cream to be served. And this wait was even more painful as the guy at the counter was mashing ice creams (aka Cold Stone style) so loudly that we couldn’t hear each other across the table. He could have bought a building down with the amount of sound pollution. Anyways, after about 15 minutes, the first ice cream was served. The Sticky Chewy Chocolate it was, and it was just alright. 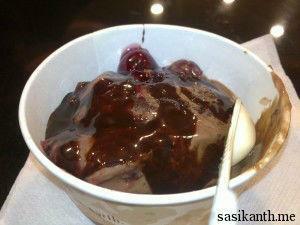 It had some gooey chocolate sauce along with chocolate ice cream and a couple of brownie chunks. It was a decent ice cream, but nothing memorable. After another 10 minute wait, the Chocolate Almond Fudge was served. My friend asked for some caramel sauce on this one, but there was none. This tasted similar to the first ice cream, with the gooey chocolate replaced by very little fudge. Again, nothing special. After an hour since we entered the place, my ice-cream, the easiest one to make of them all, Chocolate and Cream was finally served (My friends had almost finished their ice-creams by now). This one looked great, and the cream tasted yum. However, the chocolate fudge on the bottom was very very sweet, and spoilt the entire ice cream when dug into. The chocolate ice cream and cream were the only palatable items. Overall, a disappointment. None of the ice cream were out of this world good, and the noise at the place was a huge put off. I read a couple of reviews calling this place economical and pocket friendly, but I wouldn’t agree. For 500 bucks, I could have had close to 10 Kwality Walls or Amul ice creams. But for the hype and the noise, there’s nothing special about this place. Another place with raving reviews, another disappointment! Went to Viva Italia after a long time with amma on a Saturday night to have some yummy food. I decided to have a pizza and amma opted for a sandwich. It was nice to see that these guys have worked on their menu and expanded it quite a bit. They had a new Pasta on Pizza, and from the description, seemed like it was just made for me. Penne, mushrooms, onions and cheese with white sauce on a crunchy pizza base, awesome. I thought it was a little bland initially, but with some oregano, it tasted better. Amma had the Tomato Cheese Chilli toast, and it was delicious. She loved it. I decided to hog a little more and ordered for a Veggie Hot-dog. I was told that the vegetarian options are gonna be a little different from the regular hot-dogs, yet I decided to give it a try anyways. The bread was really crunchy, but I thought the stuffing inside lacked a little flavor. I would have preferred more stuffing in there. It was good nevertheless. These guys also started on desserts, serving cupcakes and brownies. I’m not a big fan of cupcakes in general, but the Raspberry cupcake was very good. Cupcakes in India are generally very sweet, but this one was just perfect. The brownie turned out to be even better. 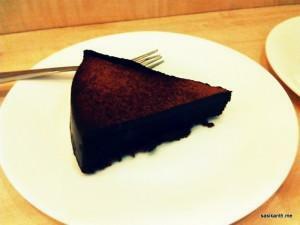 It was Chocolicious!! I so loved it that I gulped down one more. Reasonably priced at 50 and 35 bucks a piece, these are a must try. After finishing our dinner at Veggies 365 the other night, me and my friend headed off to Ohri’s for some ice-cream. This place is an extension of the original Havmor, now changed to Ohri’s Eatmore at Basheerbagh, one of the oldest ice-cream places in town, also famous for their excellent Chole Batura. So here we were to try some of their yummy deserts. I was more in a mood to have an ice-cream shake than an ice-cream itself, so ordered myself a mighty Big Chill, and my friend ordered the classic Tutti-Fruitti. The Tutti-Fruitty was served first in about ten minutes. It had scoops of Pista, Strawberry and Vanilla ice-creams, with different fruits at the bottom, topped with jelly and different sauces. Awesome!! The Big Chill has been one of my favorite shakes for a long time. 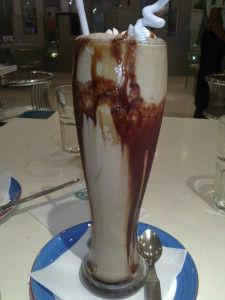 Its Chocolate Cold Coffee served with Vanilla ice-cream, with chunks of Brownie, topped off with whipped cream, served in a very tall glass. The combination is heavenly. The quantity is so good that you’ll have to struggle to finish it. Let me warn you that it might be an overdose of chocolate! Overall, yummy stuff. The ambiance is nice, and you can relax for as long as you want. The service is pretty good as well. If only Ohri’s didn’t tax you so much for the deserts turned out to be more expensive than the dinner. But still, go try the Big Chill now!! This guy has been advertising all over the place. The pictures in the ads look so bloody tempting that I’ve been dying to be here. Thanks to my friends (again), here I was on a night when I was sick :D.
The place has really swanky ambiance, and I was impressed. Again, all the pictures in the menu looked very very yummy, and it was a tough decision to choose what we wanted. After almost 10 minutes, we decided to have a single scoop each of Black Forest (cherry-pie filling, brownie, chocolate fudge), Espresso Cookie Mix (Oreo cookie, roasted almonds, caramel fudge), Apple Crumble Pie (breadcrumb, apple-pie filling, cinnamon powder, caramel fudge), and Golden Mango (Mango chunks and sauce). The Black Forest looked very different from the picture (as expected), but was great. It had a nice flavor to it. I wish they mixed in heated brownie instead of a cold one though. The Espresso Cookie Mix was alright, had a nice coffee flavor. The Apple Crumble Pie was our least favorite. It was decent, apple pie was tasty, but there was too much cinnamon for our liking. The best of the lot though was the Golden Mango. 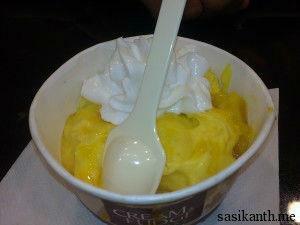 It was a no fuss ice-cream, plain mango with chunks of fresh-cut pieces. The bowl was empty even before we began with the rest. Yumm!! Overall, a nice experience. 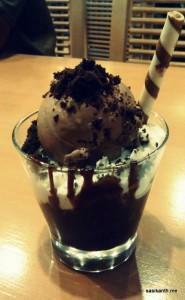 The ice-creams were good, not very sweet, and the place had good ambiance. 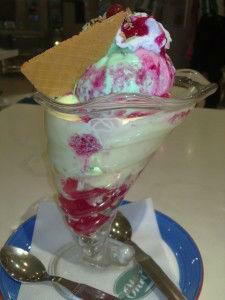 It’s way better than Creamstone, which I think serves the worst ice-cream in town. The pricing is not too bad either, considering the location and competition. The service was a little disappointing though, for the guy at the counter was a loser. Give it a shot when you have sweet cravings. 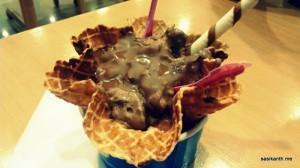 There is really nothing much to review about ice-creams, but I can sure suggest some places, right?? So here I was at the oldest ice-cream parlor in town, famous for its hand-made ice-creams. Famous isn’t a place with great ambiance. Located in an old building at the bustling Mozamjahi Market circle, you have tables laid out in the open facing the traffic, vying along with the tables of couple of other ice-cream vendors in the same compound. Me and my friend sat at one such table. Looking at the size of the ice-cream’s served on other tables, we decided to split one. We ordered the Famous Special Ice-cream. In about 5 minutes, a large portion of three-flavored ice-cream topped with nuts, flavors being Butterscotch, Vanilla and Pista, was served. The ice-cream was very smooth and yum. The tutty-fruities and nuts added nice taste, except for the raisins, which were as hard as beetle-nuts! Overall, we were very happy with what we ordered. 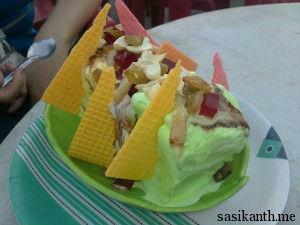 You also get seasonal fruit handmade ice-creams at this place, which are also very good, and very reasonably priced. It’s nice to try places apart from the swanky Ohri’s and Creamstone’s once in a while. The traffic and pollution around you makes you go nostalgic for a moment. 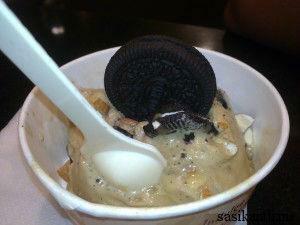 This is once place you should try in Hyderabad for sure.